Researchers at Aalto University, Finland, are the first to develop a plasmonic nanolaser that operates at visible light frequencies and uses so-called dark lattice modes. The laser operation in this work is based on silver nanoparticles arranged in a periodic array. 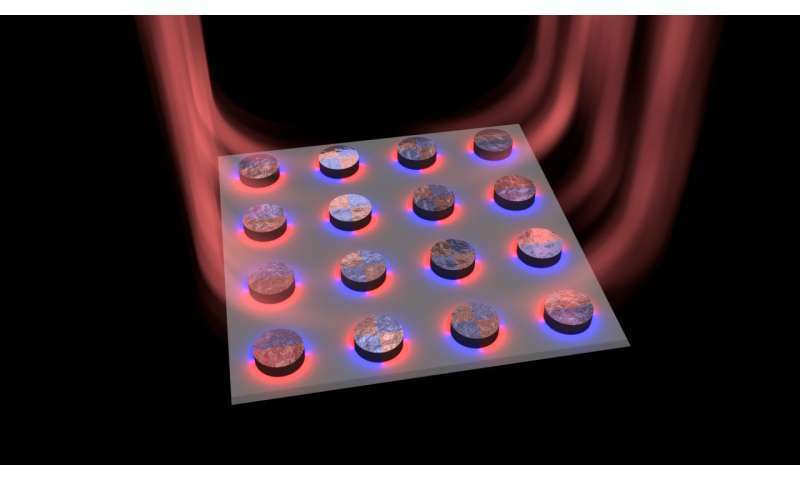 In contrast to conventional lasers, in which the feedback of the lasing signal is provided by ordinary mirrors, this nanolaser utilizes radiative coupling between silver nanoparticles. These 100-nanometer-sized particles act as tiny antennas. To produce high intensity laser light, the interparticle distance was matched with the lasing wavelength so that all particles of the array radiate in unison. Organic fluorescent molecules were used to provide the input energy (the gain) that is needed for lasing. A major challenge in achieving this lasing technique was that light may not exist long enough in such small dimensions to be helpful. The researchers found a smart way around this potential problem—they produced lasing in dark modes. "A dark mode can be intuitively understood by considering regular antennas: A single antenna, when driven by a current, radiates strongly, whereas two antennas—if driven by opposite currents and positioned very close to each other—radiate very little," explains Academy Professor Päivi Törmä. "A dark mode in a nanoparticle array induces similar opposite-phase currents in each nanoparticle, but now with visible light frequencies." "Dark modes are attractive for applications where low power consumption is needed. But without any tricks, dark mode lasing would be quite useless, because the light is essentially trapped at the nanoparticle array and cannot leave," says staff scientist Tommi Hakala. Ph.D. student Heikki Rekola says, "By utilizing the small size of the array, we found an escape route for the light. Towards the edges of the array, the nanoparticles start to behave more and more like regular antennas that radiate to the outer world."